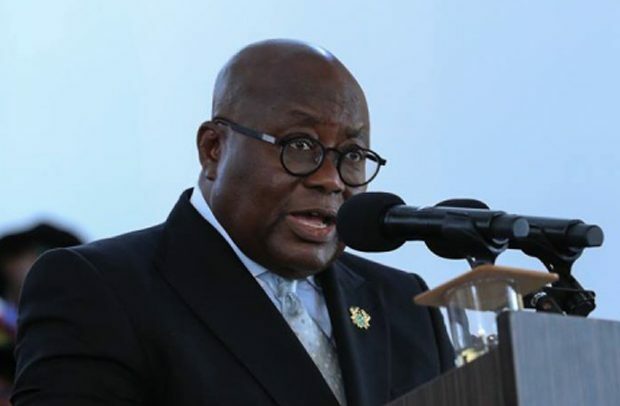 President Nana Addo Dankwa Akufo-Addo has urged beneficiaries of the Nation Builders Corps (NaBCo) programme, to exercise decorum in their work. He stressed that the recruits must ensure that their presence is felt at their place of work and also strive to pick up employable skills. Addressing the recruits at the Black Star Square during their graduation ceremony Wednesday, President Akufo-Addo said, the government has invested in the programme and the beneficiaries must ensure it pays off. “…you must bear in mind that government is investing some GH¢3 billion cedis of taxpayers money into this programme. Your monthly GH¢700 is not free money and you must earn every pesewa of it which I’m confident you’ll do,” he said. “Help build a nation you’ll be proud of. Live by the core values of knowledge, punctuality and integrity; live as nation builders. Let us together fulfil the dreams of progress and prosperity that animated the great patriots whose sacrifice brought us freedom and independence…,” he added. The President added that a mobile application will soon be deployed to monitor the performance of all recruits. He also noted that the NaBCo beneficiaries will be trained in some value addition skills for one out of every four weeks. By the end of the three years the recruits will have 36 weeks of training in value addition, he noted. The NaBCo programme is a stop-gap measure introduced by the government to tackle unemployment in the country. Tertiary school graduates who have successfully completed their National Service programme were those qualified for recruitment onto the scheme. The modules for the programme are: Educate Ghana, Heal Ghana, Feed Ghana, Revenue Ghana, Digitise Ghana, Civic Ghana and Enterprise Ghana. The government has reiterated several times that the recruits won’t be jobless at the end of the programme. However, the opposition National Democratic Congress has played down the programme saying that it cannot be sustained. Tamale North MP, Alhassan Suhuyini told Joy News the amount being paid is not worth the qualification of the beneficiaries.